The MPS A320 Simulator is a type specific FBS and features a full cockpit that is an exact replica of the A320 cockpit. The visual is a collimated, 200×40 degree wrap around Level D system and all moving flight controls have calibrated A320 control loading (force feedback). EASA FTD level 1 certification allows Airlines, TRTO’s and FTO’s to deploy the MPS A320 Simulator for all types of pilot training, including Type Rating (up to 50%), MPL, MCC, SOP, instructor courses and Command training. The MPS A320 Simulator can be upgraded from standard FNPTII/MCC to EASA FTD 1 or FTD 2 specification by upgrading the software and adding the Level D collimated visual system plus circuit breaker panel door. The related software upgrade makes the MPS A320 Simulator similar to a level D FFS (Full Flight Simulator) in all respects other than motion. Image of the cockpit of the MPS Airbus A320 simulator, EASA FTD Level 1. 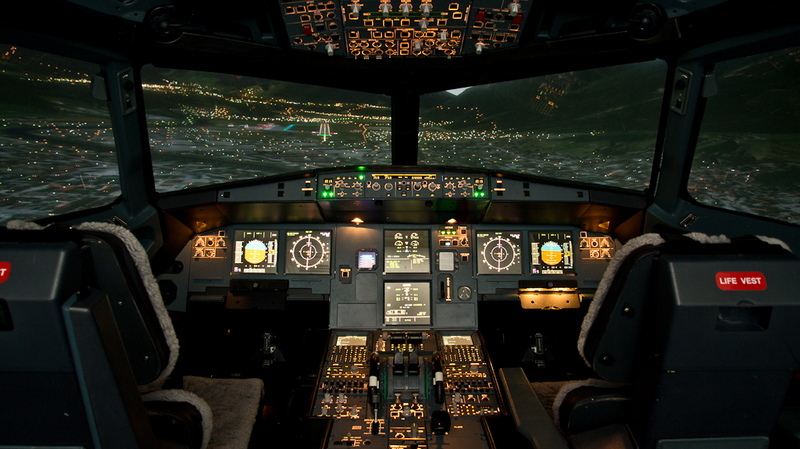 The image shows the A320 simulator in operation on final approach at night.